Chief Complaint: 29-year-old male with HA, hematuria, and visual obscurations. History of Present Illness: 29-year-old male complained of headache (HA) for several weeks. HA was worse the day before presentation (8/10) and was associated with nausea & vomiting (N/V). He went to the local ER and was noted to have hematuria. The patient was told he was "dehydrated" from the N/V, given pain meds, and sent home. On the next day, he awoke feeling weak and complained of HA and N/V. He noticed visual field (VF) obscurations in the left eye (OS). He then presented for formal ophthalmology evaluation. PMH: Poorly controlled HTN (160/108) with losartan & amlodipine. -Ill looking male with BP 160/108. -Pupils equal and reactive. No RAPD. -VF OS had small paracentral scotoma on Amsler grid. Urinalysis indicated 3+ hematuria and proteinuria. Not gross. 1+ schizocytes & helmet cells, and significantly reduced numbers of platelets. The patient was admitted, and the following day, his hemoglobin dropped from 14.1 g/dl to 9 g/dl. Although a nonspecific finding, the presence of cotton wool spots in an ill, young patient should elicit a careful review of systems and consideration of a thorough medical evaluation. Table 1 details common and uncommon diagnoses for cotton wool spots of the retina. Given the clinical presentation, our patient was diagnosed with thrombotic thrombocytopenic purpura-hemolytic uremic syndrome (TTP-HUS), see Table 2. Although, once thought to be separate pathologic entities, it is now felt that these entities represent a spectrum of a single disorder. TTP-HUS presents as a thrombocytopenia and microangiopathic hemolytic anemia associated with thrombi composed primarily of platelets in affected organs. Patients may present with: thrombocytopenia, microangiopathic hemolytic anemia, neurologic signs and symptoms (e.g., headache, vision changes, paresthesias), renal insufficiency, and fever. TTP-HUS is a deadly disorder with mortality rates over 90% in untreated patients. Plasma exchange with fresh frozen plasma is the treatment of choice and reduces the mortality rate to below 50%. Patient survival is dependent on prompt diagnosis, hospital admission, and treatment. While this patient came to our attention due to a new scotoma in his visual field from large cotton wool spots, other ophthalmic manifestations in patients with TTP-HUS include: serous macular detachments, choriocapillaris occlusion due to fibrin-platelet thrombi, retinal or vitreous hemorrhages, optic disc edema, neovascularization of the disc, and central retinal vein occlusion. Cotton wool spots can be a sign of serious systemic disease and warrant further evaluation in certain clinical scenarios. Initial testing should include blood pressure measurement, complete blood count with platelets and differential, and evaluation for diabetes. In this patient, a life-threatening illness was discovered. Although TTP-HUS is a rare disorder, it should be considered in patients who present with vaso-occlusive disease of the retina, neurologic decline, renal insufficiency, and hematologic abnormalities (such as anemia and/or thrombocytopenia). Evaluation and management of TTP-HUS should be done in conjunction with internists and hematologists. Because the mortality rate of this condition can be exceedingly high without prompt intervention, ophthalmologists may play a key role in its timely diagnosis and thus improve the likelihood of patient survival. TABLE 1: Differential diagnoses for cotton wool spots. TABLE 2: Key features of TTP-HUS. Without treatment, mortality rates can be as high as 90%. Plasma exchange with fresh frozen plasma can reduce mortality rates below 50%. Women, particularly during pregnancy and immediately post-partum. Recurrence can occur in one-third of treated patients. Chronic renal failure can occur in one-fourth of patients. Long-term support and care may be necessary. Rock, GA, Shumak, KH, Buskard, NA, Blanchette, VS, Kelton, JG, Nair, RC, Spasoff, RA. Comparison of plasma exchange with plasma infusion in the treatment of thrombotic thrombocytopenic purpura. Canadian Apheresis Study Group. N Engl J Med 1991 Aug 8;325(6):393-7. Patel, MR, Bains, AK, O'Hara, JP, Kallab, AM, Marcus, DM. 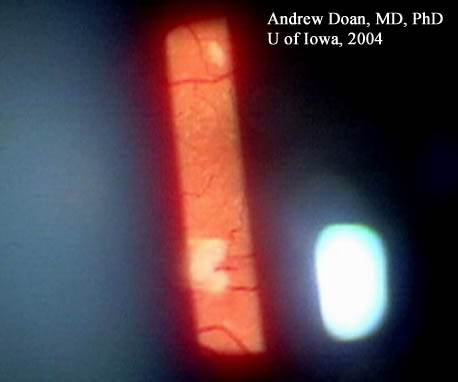 Purtscher retinopathy as the initial sign of thrombotic thrombocytopenic purpura/hemolytic uremic syndrome. Arch Ophthalmol. 2001 Sep;119(9):1388-9. Melton, RC and Spaide, RF. Visual problems as a presenting sign of thrombotic thrombocytopenic purpura. Retina. 1996;16(1):78-80. Black, RL and Terry, JE. Ocular manifestations of thrombotic thrombocytopenic purpura. J Am Optom Assoc. 1991 Jun;62(6):457-61. Jellie, HG, Gonder, JR, Canny, CL, Arce, FP, Kaufmann, JC. Ocular involvement in thrombotic thrombocytopenic purpura: the angiographic and histopathological features. Can J Ophthalmol. 1984 Oct;19(6):279-83. Suggested citation format: Doan A, Farjo A: TTP-HUS: 29-year-old male with HA, hematuria, and visual obscurations. February 21, 2005; Available from: http://www.EyeRounds.org/cases/case1.htm.